"I worked this recipe up after we had dairy, egg, almond, and grain allergies. They are delicious! 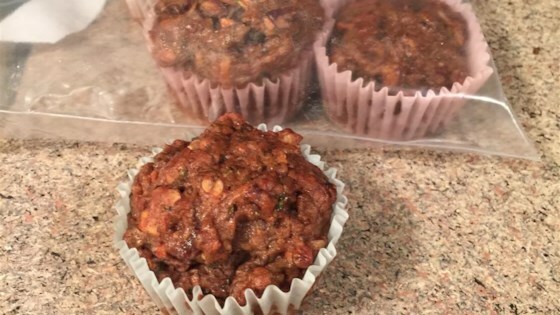 I looked at other basic muffin recipes, adjusted the ingredients to fit our dietary needs, and then experimented with them until I got it just right." Preheat oven to 375 degrees F (190 degrees C). Line 12 muffin cups with paper liners. Soak chia seeds in the water in a bowl until thickened and paste-like, 5 to 10 minutes. Whisk cashew flour, flax seed, coconut flour, tapioca starch, cinnamon, baking soda, and salt together in a bowl. Mix chia seed mixture, dates, walnuts, zucchini, applesauce, coconut oil, and stevia together in a separate bowl; stir into dry mixture until batter is just combined. Spoon batter into the muffin cups. Bake in the preheated oven until a toothpick inserted in the middle of a muffin comes out clean, 30 to 35 minutes. Cool muffins in the muffin tin on a wire rack before removing, about 10 minutes; cool another 5 minutes before serving. You can substitute almond flour for the cashew nut flour. Or you can use half nut flour and half corn flour (not corn meal). These are very good will use for a breakfast muffin I added a little maple syrup and I used rice flour instead of almond. Would like to try with a little almond flour.